This example illustrates how you can fit a normal likelihood random-effects model in PROC MCMC. PROC MCMC offers you the ability to model beyond the normal likelihood (see Logistic Regression Random-Effects Model, Nonlinear Poisson Regression Random-Effects Model, and Piecewise Exponential Frailty Model). where is the group index and indexes the observations in the th group. In the regression model, the fixed effects and are the intercept and the coefficient for variable , respectively. The random effect is the mean for the th group, and are the error term. Some of the statements are very similar to those shown in the previous two examples. The ODS GRAPHICS ON statement enables ODS Graphics. The PROC MCMC statement specifies the input and output data sets, the simulation size, the thinning rate, and a random number seed. 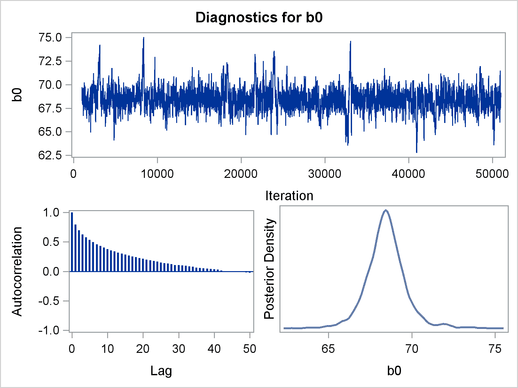 The ODS SELECT statement displays the model parameter and random-effects parameter information tables, summary statistics table, the interval statistics table, and the diagnostics plots. The PARMS statement lumps all four model parameters in a single block. They are b0 (overall intercept), b1 (main effect for gf), s2 (variance of the likelihood function), and s2g (variance of the random effect). 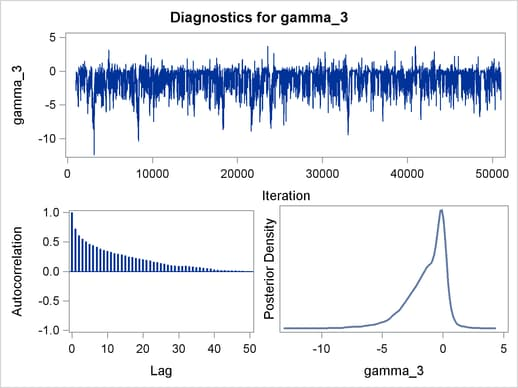 If a random walk Metropolis sampler is the only applicable sampler for all parameters, then these four parameters are updated in a single block. 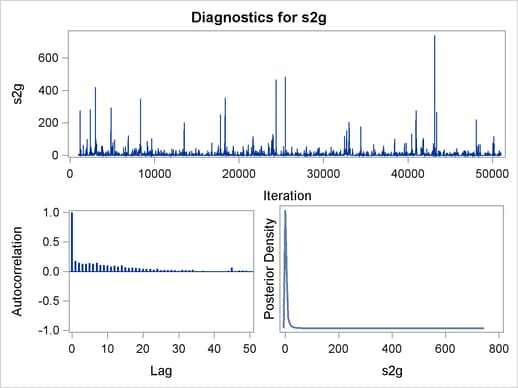 However, since the conjugate updater is used to draw posterior samples of s2 and s2g, PROC MCMC updates these parameters separately (see the Block column in "Parameters" table in Figure 54.9). Finally, the mu assignment statement calculates the expected value of height in the random-effects model. The MODEL statement specifies the likelihood function for height. 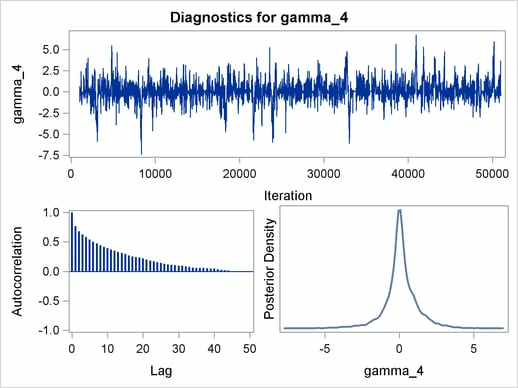 The "Parameters" and "Random-Effects Parameters" tables, shown in Figure 54.9, contain information about the model parameters and the four random-effects parameters. 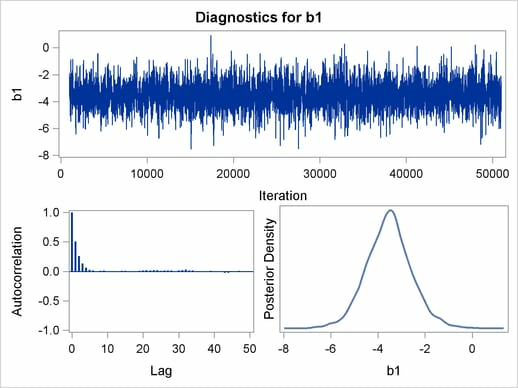 The posterior summary and interval statistics for b0 and b1 are shown in Figure 54.10. 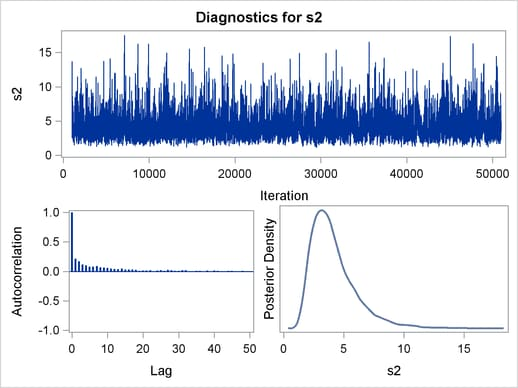 Trace plots, autocorrelation plots, and posterior density plots for all the parameters are shown in Figure 54.11. The mixing looks very reasonable, suggesting convergence.